This will guide you through the process of creating labels from information in a custom report. 1. Click on the Reports tab. 3. Click on the Title of the custom report you would like to make labels for. 1. Click on the Labels tab. 3. Give your labels a Name. 4. 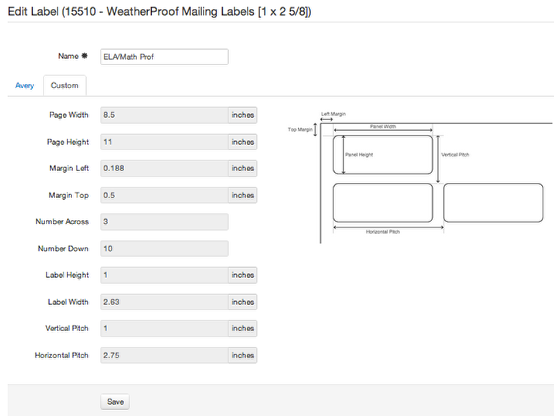 Use the drop down menu to select the size you are printing on. 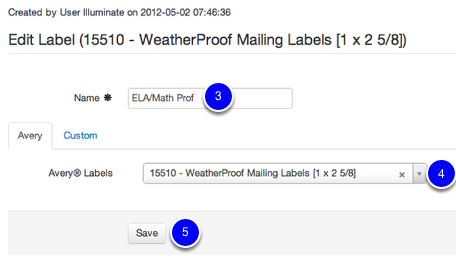 Custom label sizing allows you to customize the dimensions if using a custom label size. Select Labels at the top of your screen. Then click Layout. The columns from your custom report (a.k.a. blocks) will display on the left of the labels template. Click and Drag the block to where you want the information to appear on your label. The corner of each bar can be used to make that data smaller or bigger simply by clicking the pink lines and dragging inward or outward. The block alignment tools allows you to align multiple blocks for uniformity. 1. You can left, center, or right align the blocks. 2. You can top, center, bottom align the blocks. 3. You can adjust the height or width of the blocks. The tool will default to adjust to the tallest/widest block. If you hold your shift key as you click on the specific block alignment icon, the tool will adjust to the shortest/most narrow block. 4. When you're finished adding and formatting data blocks, click Save. A success message will tell you your pdf has been saved. Click OK. If you are wanting to add text to your labels, for example "To the Parents/Guardians of:", see the lesson on how to Add a Static Text Column to a Custom Report. Click Download to generate a PDF file containing your labels for each of your students. From the PDF, click Print. 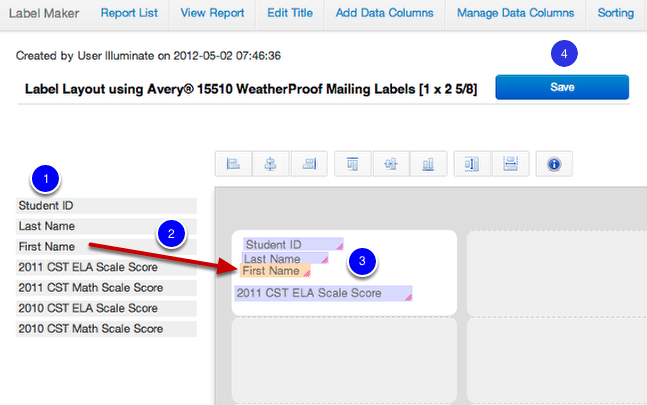 See the Add Columns to a Custom Report lesson to add additional blocks to your labels.